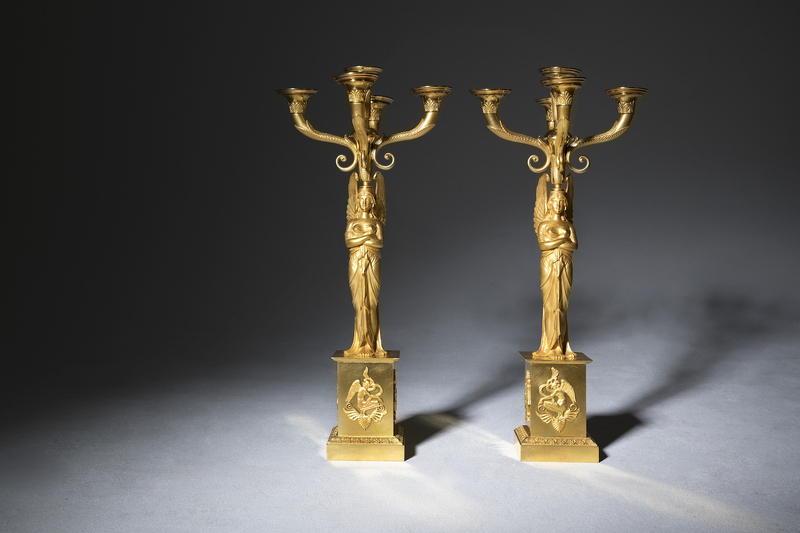 A pair of Russian ormolu bronze five light candelabra in the manner of Carlo di Rossi, circa 1810. 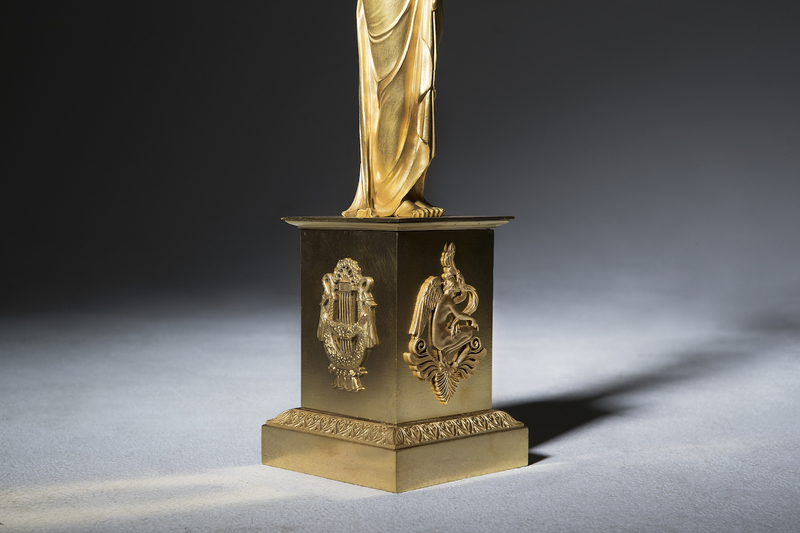 Each with a winged female figure standing on a stepped square decorated base. 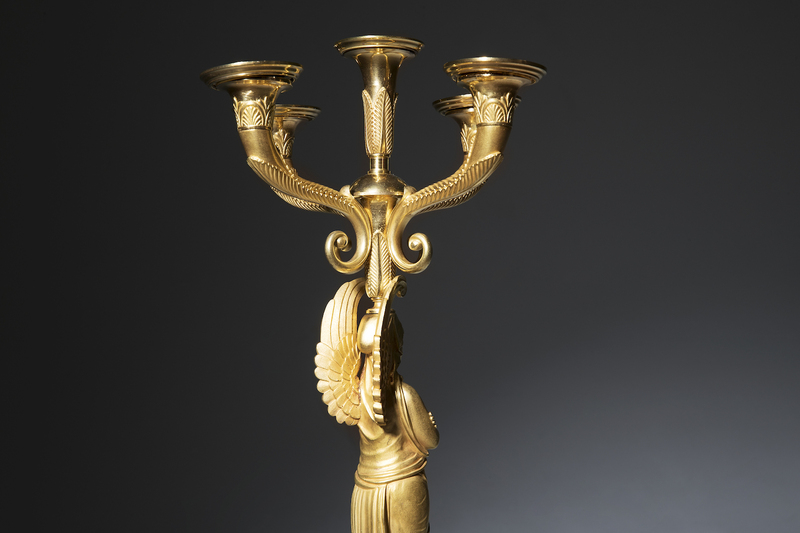 Each candelabra with four anthemion cast scrolling candlearms around a central arm. Carlo di Rossi wars born in Naples in December 1775. His mother and stepfather were both ballet artists. His mother Guertroude Rossi-Le Picq was at the time a well known ballerina and was invited to Russia to perform and brought her son. The young Rossi started his studied with Vincenzo Brenna who was an Italian architect and painter working in Russia. In 1795 he began his work as the assistant to Brenna in the service of the admiralty board of architecture. The years 1802 an 1803 he went back to Italy and studied, and in 1806 he obtained the title of architect. The architecture of Rossi are in the empire style which combines grandeur with noble simplicity, The Yelagin Palace, Saint Michael’s Palace and Pavlovsk Palace where he he built the palace library, only to mention some of his work. He died of Cholera in St:Petersburg 1849 in complete oblivion and poverty.